As pretty much everyone knows, we have a huge plastic problem. Simply Living has been proactive in promoting awareness of the plastic problem since we started passing out our No Straw Thanks stickers at Comfest a couple of years ago. That’s why the title of Joel Knepp’s brilliant, insightful article in the Short North Gazette leaped out at me! If you haven’t heard by now, the Short North, the nation, and the world are drowning in plastic. Billions of tons of plastic are manufactured every year into a plethora of items both useful and useless. Do we need all this crap? Certainly not. Could we get by with a whole lot less of this substance which never goes away but only breaks down into smaller and smaller pieces that we end up unknowingly eating in tuna sandwiches? Oh yeah! Could we do without those flotsam mini-continents which drift around the oceans and harm sea life? Undoubtedly. Once upon a time, toys, furniture, TVs, and ski boots were made of wood, metal, glass, cloth, and leather, stuff which, when discarded, eventually becomes harmless dust, rust, and bug food. These days, vast numbers of these items are made from plastic, which neither rusts nor appeals to hungry bugs. Sadly, unless you are perhaps a remote jungle-dwelling tribal person, life without a whole lot of plastic is impossible. What to do? A lot of attention has been focused lately on those pesky, ubiquitous plastic items known as straws. An increasing number of eating establishments and watering holes now act upon the notion that humans have lost the ability to hold a glass up to their lips and drink. I view this creeping “all straws all the time” trend as further evidence of the infantilization of America. It wasn’t always like this. In my youth, drinking straws in America were made of paper and mostly reserved for seriously ill or disabled people, little children (before the days of sippy cups), and folks enjoying semi-liquid ice-cream concoctions. P.S. 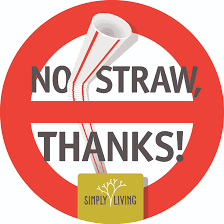 Happy to note that A&R Creative Group, owners of the Crest Gastropubs, Alchemy Cafe and a dozen or so bars and restaurants, recently responded to Simply Living’s campaign and decided to make straws available only on request. It’s a positive trend. End goal: full transition to an ecological culture!